In order to fix this error, shut down the machine and unplug the power cable from the back of the device. After about 30 seconds, plug the power cable back into the machine and turn the multifunction device back on. Try printing a test page, and if that is normal, the error has been resolved. If it doesn’t work or the error message returns, you can try a few more things. Next, turn the unit off and remove the power cord again. Open up the top of the machine, and use the carriage belt to gently move the cartridge to the middle of the machine. 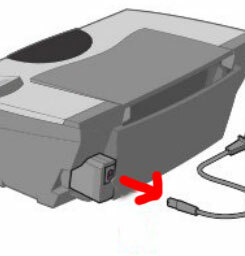 Take out both cartridges, close the top, put the power module back in and turn the unit back on. If the message returns, you most likely will need to contact Lexmark for support. If the message does not return, shut down the unit and dislodge the power supply from its hub. 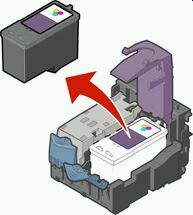 Open the top, and move the cartridge carrier to the middle of the unit. Now put in the color cartridge and turn the machine back on. If the message returns, you need to clean your cartridge contacts. Now do the same thing for the black cartridge. If the message comes back, you will clean these contacts as well. If there is no message, print another test page and the error should be resolved. If the message persists, try replacing the cartridges with new ones. At this point, if you are still receiving the error message, there is likely a hardware problem with the printer. You should contact Lexmark technical support for more assistance.